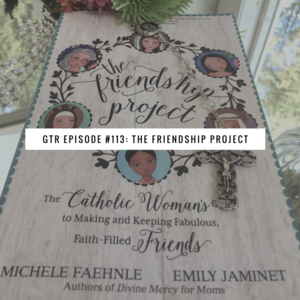 In this episode: Authors Michele Faehnle and Emily Jaminet join us to talk about their new book The Friendship Project: The Catholic Woman's Guide to Making and Keeping Fabulous Faith-Filled Friends. We are giving away a copy! E-mail: feedback@goodthingsradio.com for your chance to win. Sharing a great way to organize photos with a new "Favorite Things" feature. An update on the Arise retreat, and much more!